Safr opened its franchises in Lahore and Multan as the women-focused rideshare was receiving an overwhelming response from both cities. 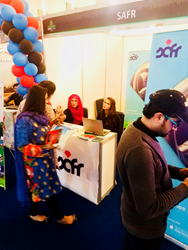 Within a couple of months of introducing the service in Pakistan, Safr has built a customer base of thousands of drivers and riders. “It’s truly amazing to see incredible Pakistani women ride and drive fearlessly with Safr during odd hours of the day.” Safr Pakistan CEO, Ramla Hassan stated. Safr, a rideshare focused on female empowerment, today announced that it is now offering its services in Pakistan. While remaining true to its mission of the safety and empowerment of women, the company is expanding its services in South Asia. Earlier, Safr opened its franchises in Lahore and Multan as the women-focused rideshare was receiving an overwhelming response from both cities. Within a couple of months of introducing the service in Pakistan, Safr has built a customer base of thousands of drivers and riders. The Safr app offers unique features like in-app calls, SOS button, color match and gender preference. The company’s rigorous driver screening and training allow it to provide a better rideshare experience and safer environment to both women and men. Drivers and riders interested in joining Safr can visit gosafr.com and download the Safr apps through the App Store or Google Play. Safr is a new ridesharing service focused on the safety and empowerment of women. Built with the needs of women in mind, the company aims to improve the lives of women through safe transportation, job creation, and financial security. Drivers are personally vetted and undergo comprehensive background checks. They are paid more than the industry standard, and are incentivized to provide best-in-class service. By choosing to ride with Safr, you support a like-minded driver, elevate your community by helping improve greater gender balance and choice in the ridesharing economy.